Situated between the banks of Chongqing’s Qing Nian Reservoir and the Palm Spring Geological Park Lake; the floating Islands of Palm Island form a new hospitality precinct within the Palm Springs International Garden. 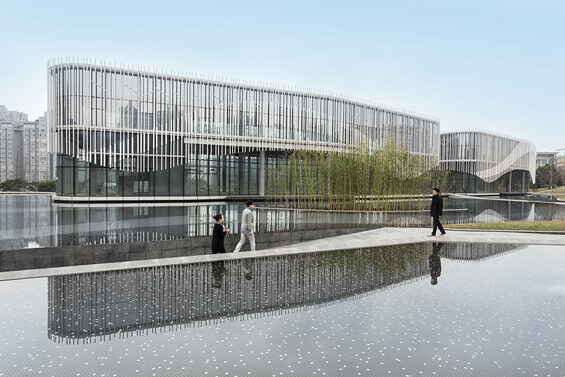 The precinct comprises five buildings (the ‘islands’) collectively housing five restaurants and a teahouse, which have been unified with the surrounding landscape through the creation of a dramatic water courtyard. 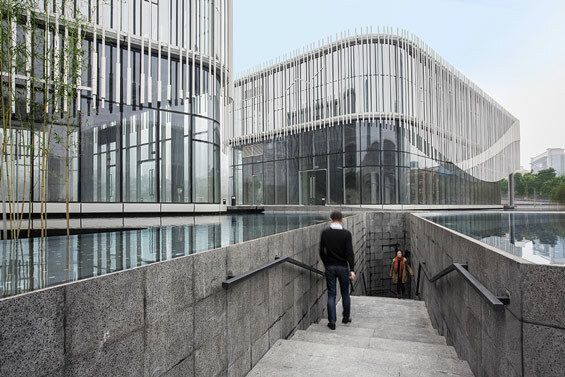 The HASSELL design was inspired by the city’s position at the convergence of the Yangtze and Jialing Rivers. It visually connects the reservoir and the lake; capitalising on the inherent qualities of the existing bodies of water and extending them to create a spectacular, uninterrupted waterscape and a hospitality experience that is unique to Chongqing. Water is the key design element, and combined with the precise detailing of the built landscape and architectural elements, multiple and ever-changing perspectives have been created. Patrons at each restaurant can enjoy natural water vistas on one side and private water views of the courtyard on the other; integrated visually through the creation of an infinity pool-style water platform. 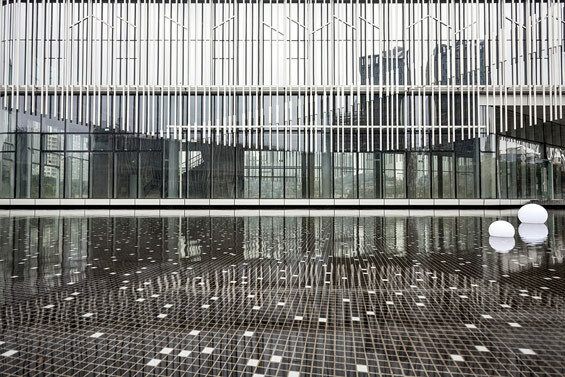 This external water platform creates a continuous reflection plane and gives the impression that the buildings are floating. Rhythmical passages of local stone slice through the platform creating central pedestrian connections. Its elevation cleverly conceals the operational aspects of the precinct, such as parking, loading areas and kitchens, and the recessed interfaces preserve sightlines while navigating level changes to the services beneath. The arrangement allows the public aspects of these dining zones to be revealed above the waterline, so that patrons are able to fully appreciate the water views in all directions. The design optimises the interplay between light, water and form to unite the built and natural environments and create an inimitable dining experience. Each building is encased in a façade of white ceramic rods that are arranged in vertical waves at varying thicknesses. 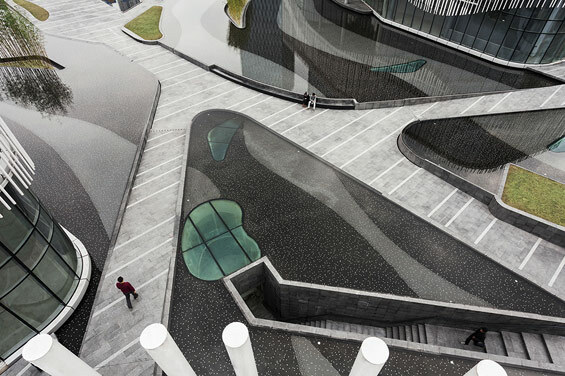 The curved, crystal-like glass forms of the buildings combine with the strong vertical waves to alter the visual density depending on a viewer’s perspective. During the day these white sunlit contours reflect shimmering patterns on the water’s surface that are highlighted against the dark underwater tiles of the courtyard; the ‘vibrating’ lines on the gently shifting water evoking a musical quality. 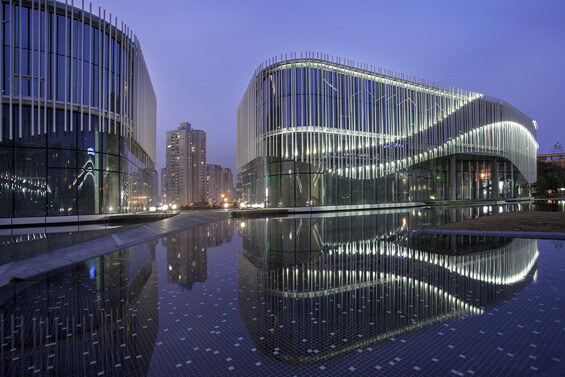 At night, a dream-like atmosphere is created combining various subtle lighting effects in the landscape with dynamic lighting sleeved inside the thicker rods of the building façades. The light floods out to highlight the thinner rods, enhancing their reflections and allowing the shining wave patterns to be the strongest visual expression. Chongqing is one of the hottest cities in China, and the need to maintain a comfortable environment for patrons and the sustainable operation of the precinct were important considerations of the overall design solution. 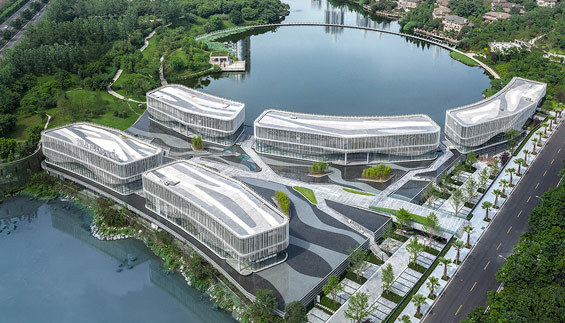 Both the reflective façades of the buildings and the cooling breezes created by flow-through ventilation across the water courtyard help to reduce temperatures and energy use. Water is captured for use and recycled within the water features and during the dry season they are supplemented with water from the lake. Grey stone slab and native vegetation have been used for their resilience and to reflect the local character. 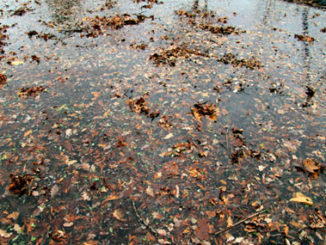 “Water is fundamental throughout the scheme. 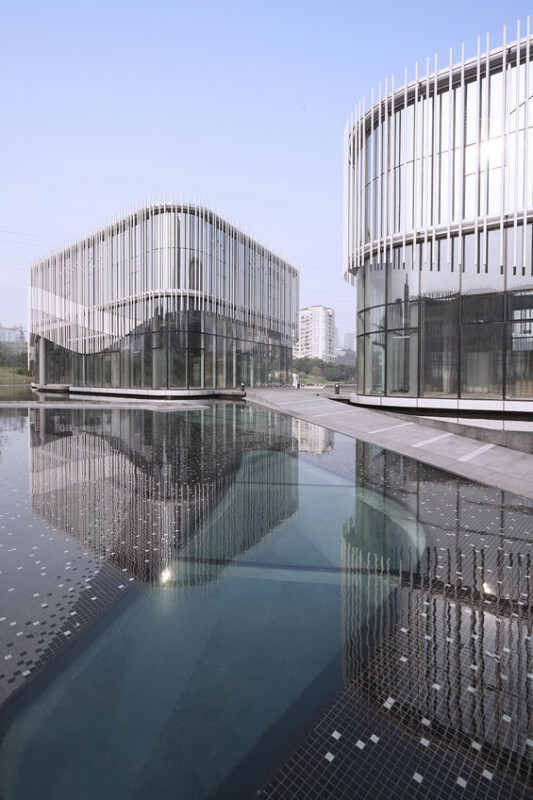 The courtyard is designed as a still reflection plane with slick edges so that the buildings can be beautifully mirrored on the tranquil water and the lighting effects can dance on the surface. We deliberately put the pathways beneath the waterline so that people can experience the water on both sides as they approach through the landscape on their way to the restaurants. Views of the surrounding waterscapes can be experienced in all directions from inside the restaurants as well”, he said.